This looks three-horse race from a betting perspective. Contentment is priced 8/15, with Secret Soul 3/1 & Poet's Vanity 5/1. Not sure what the over round is on that but those odds look ridiculous. The third mentioned, trained by Andrew Balding, may be worthy of note if drifting to much bigger prices. This 200,000G yearling buy could make an each-way alternative if the favourite is hammered. Division II of this maiden. Marcus Tregoning doesn't have many two-year-olds in his string these days but Argenterie is held in high regard after finishing third on debut at Goodwood. Owned and bred by Miss K Rausing, connections expect a tidy win here and progression to a higher level. A few lofty entries give the impression they mean business. This should be a great win opportunity at 4/5f. A restrictive race type. A few trainers will be coming here fancying their chances. King's Coinage was well backed last time out and I'm pretty sure he was expected to run much better than seen. If that was a below standard effort he may hold some value at 33/1 [touched 130/1 on Betfair before being substantially backed] and could be gambled. Charlie Chaplin has been fancied on both starts but never achieved a great deal. I wasn't impressed with this horse physically earlier in the season so it will be interesting to see if he has strengthened up. Once again, he seems to be short-ish in the betting and a horse I will watch with some interest but not betting. There wasn't much between Magical Forest and Tonahtu last time at Kempton. 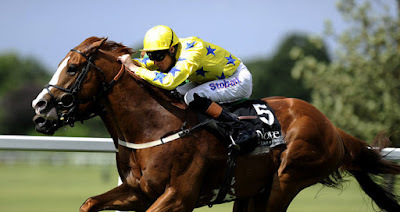 Both have a fair level of ability for this grade and connections of Magical Forest must be scratching their head why this substantial filly has been placed four times but yet to win. I wonder from a low draw if they will go to the front and try to lead al the way. On form some may favour Ed Walker's charge as she finished in front last time. She may well do the same again. Charlie Racal was well backed at Leicester in what looked a pretty hot contest for auction class. He showed good pace that day before tiring in the closing stages. A wide draw isn't ideal. A tricky race in ways. I'd give Magical Forest one last chance but wouldn't bet betting today. Looks an open contest.